Charles is the lucky winner of a Ford F-150 Supercrew truck from Sanderson Ford! He donated to Operation Santa Claus for the chance to win! The 17th annual Operation Santa Claus holiday charity drive has concluded at ABC15. With your generosity, we were able to raise $650,560, a new record for Claus-a-thon. Thank you, Arizona! Every person who contributed had the chance to win a brand-new vehicle, and Charles from Sun City was the lucky winner! He gets to take home a new Ford F-150 Supercrew from Sanderson Ford! Operation Santa Claus is an Arizona tradition. It’s a partnership between ABC15 and Sanderson Ford to collect food, toys, clothes and monetary donations for Arizona charities. This year’s charities are: St. Mary’s Food Bank Alliance, Special Olympics Arizona, Southwest Autism Research and Resource Center (SARRC) and Military Assistance Mission (MAM). Operation Santa Claus ran through Dec. 19 and culminated the following day with a “human chain” of volunteers who help deliver all the collected goods to Arizona families in need. Donors who contributed five dollars or more to Operation Santa Claus will be were entered to win a brand- new vehicle. Sanderson Ford and Lincoln randomly selected one lucky donor to win the choice of a new Ford F150 SuperCrew or Lincoln MKC luxury crossover vehicle. Fifteen finalists also received a $100 Visa gift card. 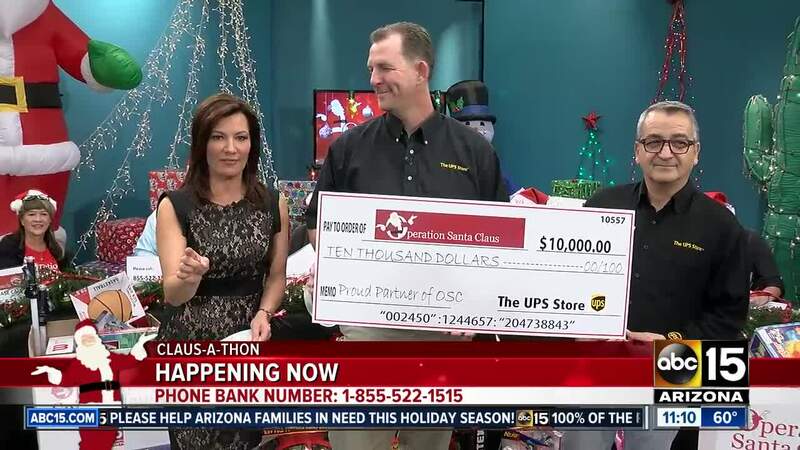 ABC15 and Sanderson Ford and Lincoln are proud to partner with The UPS Store locations, Walmart, iHeartMedia, Bonneville Media, Hubbard Radio, Entercom Radio, Arizona Diamondbacks, Arizona Coyotes, Arizona Cardinals, Phoenix Suns, Four Peaks Brewing and Papa Johns Pizza for this year’s drive. For more information go to givetotheclaus.com .